OAK 311 has received this issue. Your service request ID is #899103. Please check back for status updates, or contact us directly at 510-615-5566. Burned remains of a shelter. Debris in road, not blocking traffic but in the gutter. On Fallon St. close to Oak St.
OAK 311 has received this issue. Your service request ID is #897489. Please check back for status updates, or contact us directly at 510-615-5566. 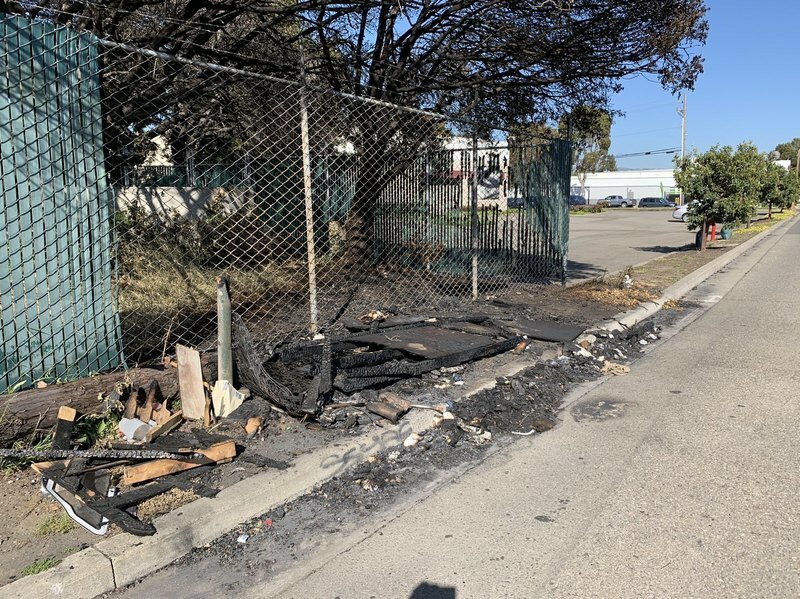 The City of Oakland addressed this issue on 04/25/2019, service request #897489. Issue is not addressed. Stop closing these without doing the work. OAK 311 has received this issue. Your service request ID is #899099. Please check back for status updates, or contact us directly at 510-615-5566. OAK 311 has received this issue. Your service request ID is #899098. Please check back for status updates, or contact us directly at 510-615-5566. OAK 311 has received this issue. Your service request ID is #891615. Please check back for status updates, or contact us directly at 510-615-5566. OAK 311 has received this issue. Your service request ID is #899083. Please check back for status updates, or contact us directly at 510-615-5566. Been here two days in a preferential parking district without a ticket. OAK 311 has received this issue. Your service request ID is #899082. Please check back for status updates, or contact us directly at 510-615-5566. OAK 311 has received this issue. Your service request ID is #898839. Please check back for status updates, or contact us directly at 510-615-5566. OAK 311 has received this issue. Your service request ID is #898809. Thank you, in advance, for your patience as we work through a backlog of pothole service requests. Unfortunately the City does not have enough funding to repave all streets in poor condition. With limited funding, our response to resurfacing requests is limited to minor pavement and pothole repairs only. Our Street Maintenance Department will assess your street and determine whether temporary measures might be appropriate. Please understand that this work may be limited to pothole or other minor repairs, and that we have many similar requests. We will do our best to respond in a timely manner. The backlog of streets in Oakland needing pavement currently is $435 million and growing. Thank you for your request. According to our system, we already have an open service request of this kind at this location. Your request has been combined with service request #556025. If you would like to check the status of the request, please contact OAK 311 at 510-615-5566 or OAK311@oaklandnet.com. This issue can also be followed by watching http://seeclickfix.com/issues/1402034. OAK 311 has received this issue. Your service request ID is #898723. Please check back for status updates, or contact us directly at 510-615-5566. This intersection has a stop sign on only one side of this four-way intersection (the side closest in the image). This intersection is, therefore, confusing especially to pedestrians and non-resident drivers since people tend to speed up the hill. This intersection is also located next to two schools. Why is this the case? OAK 311 has received this issue. Your service request ID is #899095. Please check back for status updates, or contact us directly at 510-615-5566. This is a duplicate of a previous issue. Our neighborhood does not want a stop sign on the uphill. It is too dangerous. Regularly stopped cars going uphill is very dangerous.